Asnake that had swallowed a tennis ball had to have the item massaged out of its gut by a vet, after it was found by a snake catcher in Townsville, Australia. The 1.5m carpet python was taken to a local vet surgery on Monday by local snake handler, Brian West. “Maybe everyone six months we’ll find ones with something strange in their stomachs, like golf balls and porcelain eggs,” he said. But a tennis ball was a first. 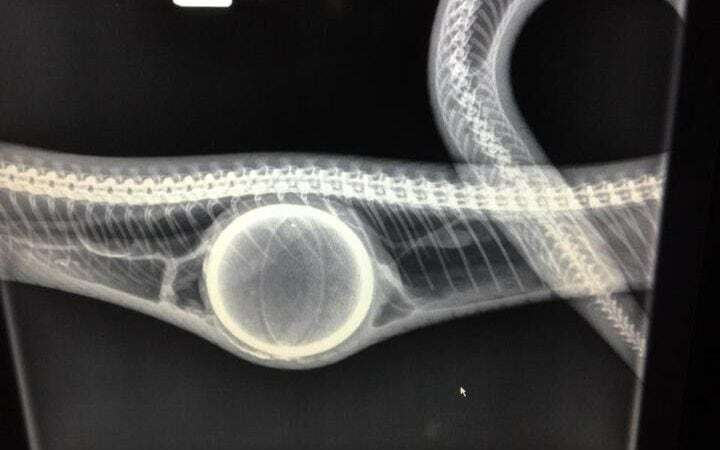 The senior vet nurse at Townsville Vet Clinic, Trish Prendergast, decided to remove the ball by lubricating it with paraffin oil and slowly massaging it back up the reptile’s oesophagus. She was able to x-ray to stomach to ensure it had not broken any bones. Without the intervention, the snake would have likley died from starvation, as the ball would have prevented it digesting any other food. The unharmed constrictor will be released back into the wild this weekend.